1. The number one thing you can do to make sure you do well at your fiance visa interview is to know your fiancé very well. You should know about his past (previous marriages, criminal matters etc.) and know all about his current situation (where he works, where he lives, does he have children etc.) Knowing your fiancé well will put you in the best position to ace the fiancé visa interview. 2. Talk to your fiancé and review the facts surrounding the history of your relationship prior to the interview. You should know when you met, how you met and how the relationship developed. You should also know your joint plans for the future. 4. Bring all the paperwork that the embassy requests you to bring to the interview. This also includes your interview notice, your entire K-1 package and all supporting documents that you have filed during the case. Also bring documentation available to prove the “bona fides” of the relationship e.g. proof of contact with each other through cards, social media, phone etc. 5. If your American fiancé is sending you money for support bring proof of that support to your interview. 6. 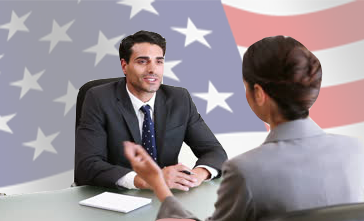 Never lie or mislead the Immigration Officer at your interview. Tell the truth. Lying can have long lasting and very severe consequences in your case. 7. Never argue with the Immigration Officer handling your interview. Always stay calm. In the history of fiancé visa interviews I do not think arguing has ever improved the chances of a fiancé obtaining a fiancé visa. 8. Answer the question you have been asked. Do not go off on tangents about things you think the immigration officer needs to know. He will ask you what he needs to know. 9. Stay calm and do not appear nervous. It is normal to be nervous. However, try not to act nervous as it could appear that you are trying to hide something or that you are not telling the truth (which you should be). The entire interview is likely to last only 15-30 minutes. It could even be shorter if the Immigration Officer is satisfied with the file and the interview. 10. Do not, under any circumstances, open the thick sealed envelope that you receive at the end of your interview. Doing so can have very severe consequences including having your fiancé visa revoked and a denial of entry into the United States for years.